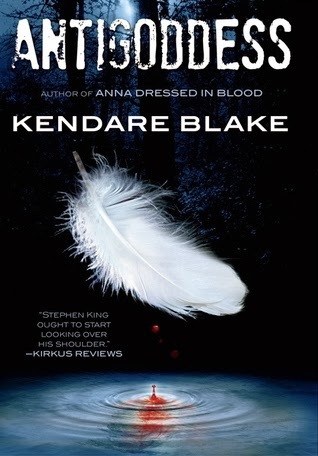 I’ve been entranced by the cover art for Kendare Blake's Antigoddess ever since I saw it and read the official summary early last year. It sounded bloody, slightly terrifying, and (honestly) pretty magic. I’ve had it out from the library for a few weeks now, but I finally sat down for a few hours of quality reading time the day before yesterday because I told my book club that I was reading it. And although that was technically true at the time (I was halfway through the first chapter), I wanted it to be more true. Lucky me, Antigoddess is the sort of story that doesn’t let you go once it has got its teeth into you. In a good way, of course. The Greek gods are dying mysterious, horrible deaths. Athena is sprouting feathers from within. Her brother Hermes is wasting away. None of them know how or why it’s happening, but they are banding together to kill each other – or die trying. In a desperate bid to save themselves, Athena and Hermes set out on a quest to find the prophet Cassandra, in hopes that something about her will change their fates. The trouble is, this time around Cassandra is an innocent (and ignorant) teenage girl, and the other side isn’t going to go down without a fight. Antigoddess is a story for Greek mythology junkies. It’s for kids who grew up reading D’Aulaire’s Book of Greek Myths, The Odyssey, and Edith Hamilton’s Mythology. That isn’t to say that if you haven’t read those books you CAN’T enjoy the book, but it won’t make nearly as much sense or be as easy to read if you don’t have the background. Lucky me, I was raised on all of the books above. Antigoddess was fun, quick reading, as well as a little dark, a lot savage, and all the way entertaining. I thought the movement inherent in the plot was one of the strongest parts of the book. I don’t want to spoil any twists, so I’ll just say that it starts with a journey, and ends with a full-blown war. Also possibly the end of the world? But yes, a war between the gods at the very least. The beginning was a little slow – push through the first two chapters and you’ll hit the more interesting bits (at least, that was my take). The action is helped along by the fact that most of the narration is split between Athena and Cassandra, and Athena is a goddess bent on justice and action. Return for a minute to the part above where I said that the book was best if you’d read Greek mythology previously… that’s because much of the characterization relies on previous knowledge of the temperaments and exploits of those gods. The back story is really back story, in this case. And that’s not a problem, unless you expect pages of character exploration. You won’t get it. Instead, the focus is squarely on the action, the twists of the story, and the dealings between humans and gods. Blake does a good job of making a millennia-old creature’s thought patterns both immediate and authentic. Antigoddess is a dark young adult fantasy that relies heavily on Greek myth, but also explores themes of atoning for the past, the struggle to survive, and if it is possible for people (or gods) to change their natures. It’s a little violent, a little gory, and a perfect set-up for what’s sure to be an epic death match. Recommended for: fans of Greek mythology and young adult fantasy retellings, and readers who enjoyed Neil Gaiman’s American Gods and/or Tessa Gratton’s The Lost Sun. I love Antigoddess so much! Kendare is an amazing writer. I can't wait for the next one in the series. Great review! I definitely agree that the reader needs to be a mythology fan first. I liked this one, but I've always been an Athena geek. I must try this. I'm such an Anna fan. I'm curious to read this just to see if some of my favorite, lesser know, gods show up.